JK Tramp Stamp II (Wide Vent) with License Plate Mount for Jeep Wrangler JK 2007-2016. 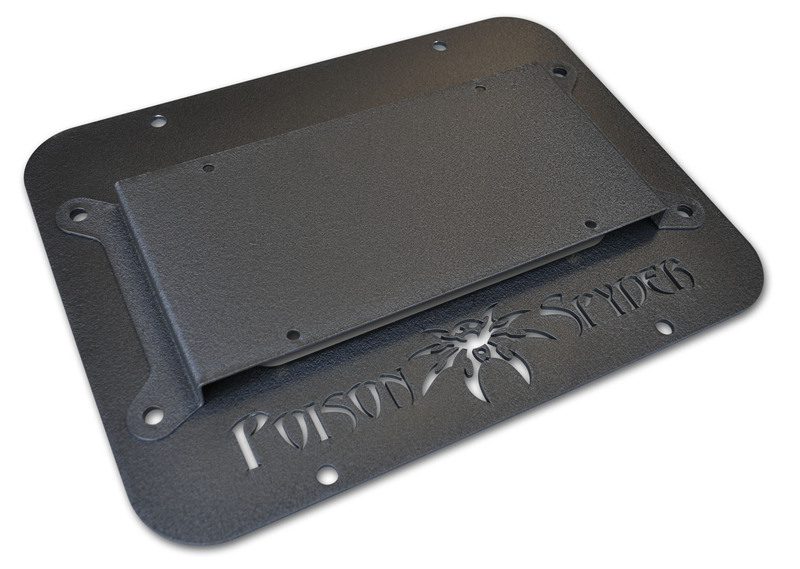 The Poison Spyder JK Tramp Stamp perfectly fits over the raised vent area in the center of the tailgate to complete the Poison Spyder gear surrounding your Jeep JK. The center of the Tramp Stamp II is cut out to allow the tailgate vents to function properly. The Tramp Stamp II is easily mounted using the Stock spare tire carrier bolts (no drilling required). This part is CNC laser cut from 1/8 inch aluminum plate, and is powdercoated in a textured black finish. The JK License Plate Mount is available separately or in a bundle with the Tramp Stamp II. If using this item to relocate the license plate, we also recommend using the LED License Plate Light and the Stock License Plate Delete Cover. Note: This item fits JKs with the Wide Vent on the tailgate (vent is wider than it is tall). These are generally found on 2010 and newer JKs, however they have also been found on some 2009s. This item is Not a direct fit for JKs with the Tall tailgate vent (taller than it is wide), which were typically found on 2007-2009 JKs. On Jeeps with vertical tall vent, this item may be used if the vent assembly is either removed or trimmed to fit. Regardless of your year model, we strongly advise that you visually verify which vent your JK is equipped with before ordering (will require removal of the Stock spare tire mount).